Reverse opening zippered main compartment with padded laptop pocket (fits up to a 15" laptop). Zippered front pocket provides additional accessory storage. 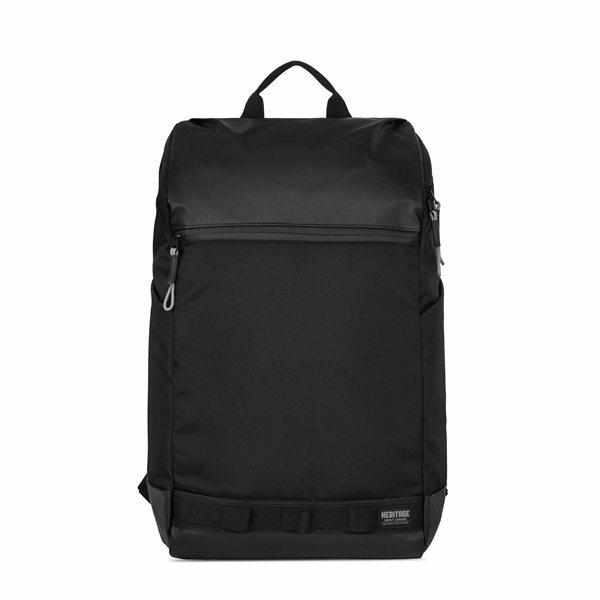 Durable with wipeable coated materials and water-resistant coated zippers. Dual side water bottle pockets. Padded, sport mesh back panel for comfort and breathability. Webbing loop detailing on the front of the backpack allows you to clip a carabiner to the bag. Adjustable sternum strap for optimal carrying comfort. Trolley strap feature slips over luggage handle for easy transport, and includes a zippered pocket for stashing small accessories while on the go. Fabric/Material: 750D Polyester, 1000D Polyester.